Dilli Haat is an open-air food and shopping plaza located in Delhi, India. It is run by the Delhi Tourism and Transportation Development Corporation or DTTDC. The Dilli Haat was opened to the public on March 1994 and is now adjoined to a craft bazaar. It was jointly established by the Delhi Tourism, Government of Delhi, New Delhi Municipal Council (NDMC), Ministry of Textiles, Ministry of Tourism, D.C. Handicrafts and D.C. Handlooms. Indian culture is greatly represented in Dilli Haat market through food and crafts. The plaza is paved in brickwork and stone that is intermingled with flowering shrubs, grass and eucalyptus trees. The market encourages families to visit by providing a play corner for small children. The whole place is indeed conducive for leisure strolls and shopping. Spread over approximately six acres of ground area, Dilli Haat is an upgraded version of a traditional weekly Indian market. It showcases and sells Indian crafts to the public in various, ever-changing mobile stalls laden with diverse items such as beads, silk and wool fabrics, rosewood and sandalwood carvings, decorated camel hide footwear, jewelry, paintings, house wares, extraordinary and special textiles and draperies, brassware, metal crafts and many more. Prices are relatively reasonable and not subject to additional maintenance costs unlike in other markets. An application process allows merchants to sell their products in Dilli Haat. Spaces are assigned according to what region or state the seller is from. The market actually boasts of over two hundred craft stalls. Craftsmen from all over India who are registered with D.C. Handicrafts converge here to sell their wares in a rotational basis that change every fifteen days, ensuring that shoppers can buy genuine items when they come to visit. Handicrafts and handlooms promotional shows are also held at the exhibition hall in the Dilli Haat complex. The food plaza on the other hand offers various stalls featuring exotic food from different parts and regions of India. Visitors can indulge in a gastronomic experience full of diverse flavors and spices. There are Bamboo hot chicken from Nagaland, Guijati Dhokla, Kahwa and Kebabs from Jammu, momos from Sikkim and Pooranpoli from Maharastra. Regional food festivals are also held there. The food is clean and carefully prepared with proper hygiene in mind. Affordability is assured here as well. It has then become a one-stop Indian food trip in the heart of the city. Unlike in a traditional market, Dilli Haat has a permanent location. The market has become fully wheelchair-friendly with accessible restrooms since 2003, a rarity in most places in India. There are currently two bazaars. One is located on Sri Aurobindo Marg near the All India Institute of Medical Sciences which is opposite the INA Market. The other one is located at Netaji Subash Place in Pitampura, North Delhi. 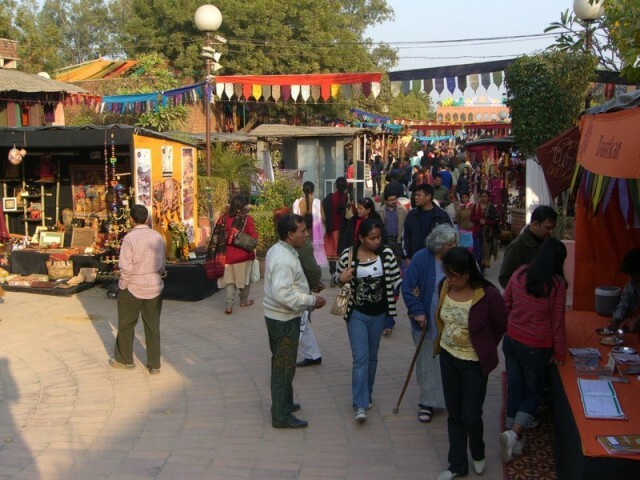 The second Dilli Haat near the Pitampura TV Tower was established on April 2008. Because of the success of such markets, the DTTC has plans of opening more Dilli Haats all over Delhi soon. Dilli Haat is open seven days a week, from 10:30AM to 9:00PM. Fees are cheap for both adults and children as both Dilli Haats are accessible using the metro stations. So if you are quite constrained with time and money to travel all over India, make sure to stop by any Dilli Haat to get a taste of what India is all about.